Since 1996, Kim Bischoff has led the charge on Washington as we advocate for securing federal funding for NF research. In addition to her role as Executive Director, Kim sits on the CDMRP panel as a consumer and has done both peer review and programmatic review for the last 8 years. Kim, along with 83 advocates from 23 states, attended the Hill visit on February 11-13th this year with the NF Network Advocacy Program. Kim shares her story and experience of how she is spreading awareness and advocating for federal funds for NF research with her interview above. The NF Network Advocacy Program is the leading national Neurofibromatosis advocacy program working to secure federal funds for neurofibromatosis research. The program consists of several NF patient advocacy organizations coming together as one voice on Capitol Hill educating congress on the importance of funds for NF research. The program is advised by a Leadership Council and attended by NF patient organizations and individual participants. For the past 20 years, During Hill Visit days, the NF Network Advocacy Program stomped the halls of congress with strong NF advocates educating congressional offices about the importance of federal funding for NF research. 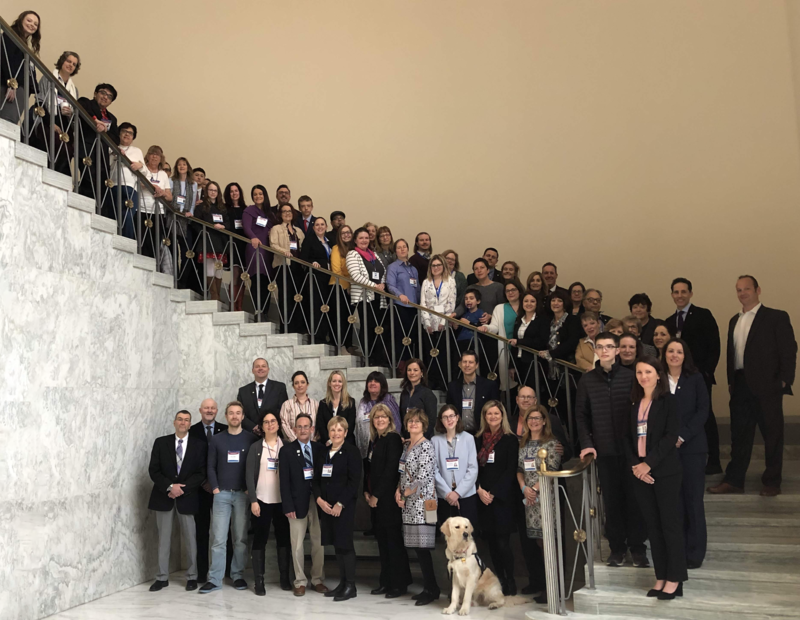 Advocates participating in this program have been the voice of the NF community on Capitol Hill for 20 years, and have been instrumental in generating over $600 million dedicated to NF research. Funded research led to the creation of the NF Clinical Trials Consortium a group of 21 clinical sites worldwide with an operational center to analyze data. NF advocates, urge his/her Senators and Representatives to support NF research funding through the CDMRP and the NIH. Continued Congressional funding is critical to the clinical trials that may ultimately lead to a treatment and cure for NF and related disorders. It is with support of the NF Advocates that the funding programs become possible. Click the photo to view photos from the NF Network Advocacy Program 2019. Since 1996, NF research has been funded by Congress at the Department of Defense (DOD) through a Congressionally Directed Medical Research Programs (CDMRP) called Neurofibromatosis Research Program (NFRP) and through the National Institutes of Health (NIH). The Congressionally Directed Medical Research Program (CDMRP), ran through the Department of Defense, was created in 1996 and is an efficiently run national program that offers cutting edge awards targeted directly towards Neurofibroatosis research through a competitive peer-review process to fill gaps in ongoing research, complementing initiatives sponsored by other agencies, such as the National Institutes of Health (NIH). We need your voice Join the NF Network advocates. 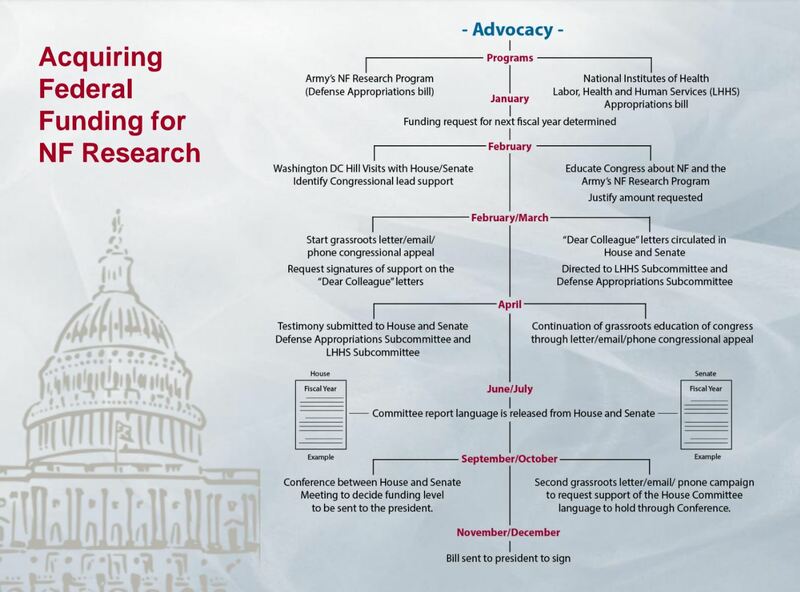 As the national leaders in the promotion of government-funded NF research we need Your voice to bring the NF message to Congress each year to secure federal funds for NF research. As an advocate, you will Generate action from our elected officials by making calls and writing letters Stay on top of policy and legislative issues through alerts and updates Help elevate the need for NF Research funding Join us to increase NF research dollars Create your own personal story! See below for samples of letters we have received for reference on how to write your own personal story. To establish a meeting with your representative in your local district use the following links, for the House and Senate. After finding the representatives names, call the local office and ask to speak with the person who handles state scheduling and request a time to meet with the member of Congress when they are in the district. If they will not be in the office when you would like to meet, request to meet with a health or defense aide in that office. The ideal time for meeting is in the Month of February or March. For more information watch the webinar below on how to structure your local meeting. Please call us here at the office and we will be happy to assist you, 630-510-1115. During Hill Visit days for the past 20 years the NF Network Advocacy Program stomped the halls of congress with strong NF advocates educating congressional offices about the importance of federal funding for NF research. 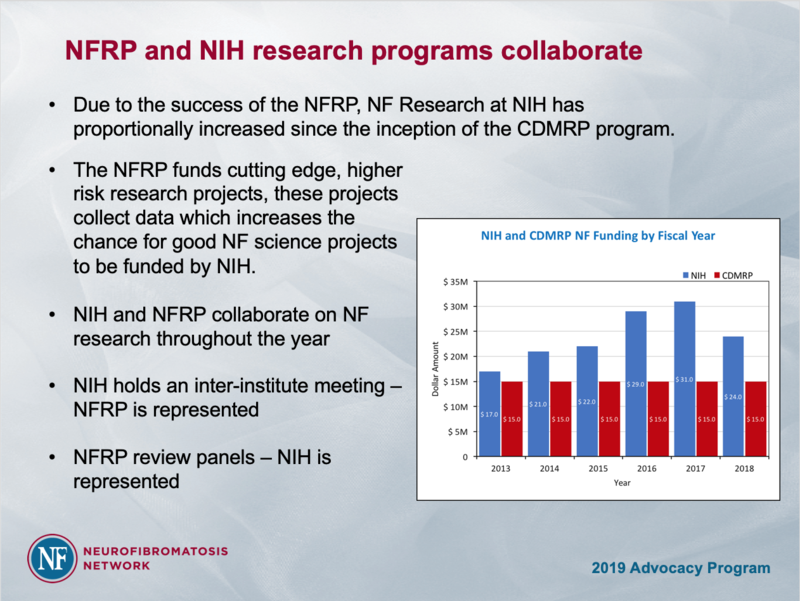 Advocates participating in this program have been the voice of the NF community on Capitol Hill for the past 20 years, and have been instrumental in generating over $600 million dedicated to NF research.